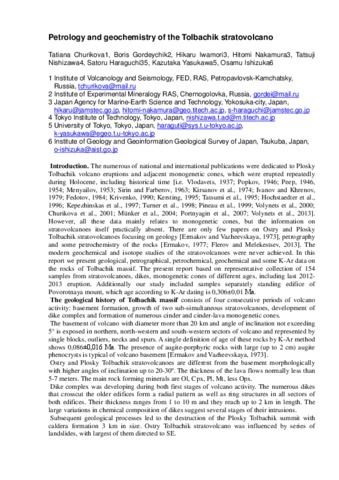 Abstract Data on the geology, petrography, mineralogy, and geochemistry of rocks from Kamen Volcano (Central Kamchatka Depression) are presented and compared with rocks from the neighbouring active volcanoes. The rocks from Kamen and Ploskie Sopky volcanoes differ systematically in major elemental and mineral compositions and could not have been produced from the same primary melts. The compositional trends of Kamen stratovolcano lavas and dikes are clearly distinct from those of Klyuchevskoy lavas in all major and trace element diagrams as well as in mineral composition. However, lavas of the monogenetic cones on the southwestern slope of Kamen Volcano are similar to the moderately high-Mg basalts from Klyuchevskoy and may have been derived from the same primary melts. This means that the monogenetic cones of Kamen Volcano represent the feeding magma for Klyuchevskoy Volcano. Rocks from Kamen stratovolcano and Bezymianny form a common trend on all major element diagrams, indicating their genetic proximity. This suggests that Bezymianny Volcano inherited the feeding magma system of extinct Kamen Volcano. The observed geochemical diversity of rocks from the Klyuchevskaya group of volcanoes can be explained as the result of both gradual depletion over time of the mantle N-MORB-type source due to the intense previous magmatic events in this area, and the addition of distinct fluids to this mantle source. 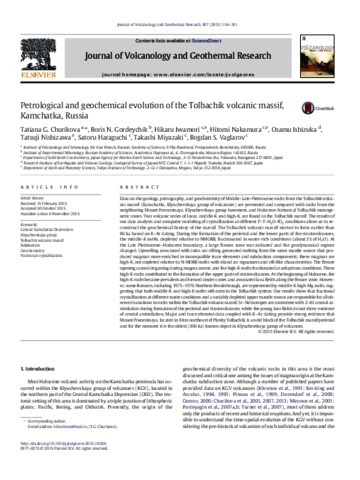 The Klyuchevskaya group of volcanoes (KGV) located in the northern part of Kamchatka has the highest magma production rate for any arc worldwide and several of its volcanoes have been studied in considerable detail [e.g. Kersting & Arculus, 1995; Pineau et al., 1999; Dorendorf et al., 2000; Ozerov, 2000; Churikova et al., 2001, 2012, 2015; Mironov et al., 2001; Portnyagin et al., 2007, 2015; Turner et al., 2007]. However, some volcanoes of the KGV including Late-Pleistocene volcanoes Bolshaya Udina, Malaya Udina, Ostraya Zimina, Ovalnaya Zimina, and Gorny Zub were studied only on a reconnaissance basis [Timerbaeva, 1967; Ermakov, 1977] and the modern geochemical studies have not been carried out at all. Among the volcanoes of KGV these volcanoes are closest to the arc trench and may hold information on geochemical zonation with respect to across arc source variations. We present the first major and trace element data on rocks from these volcanoes as well as on their basement. All rocks are medium-calc-alkaline basaltic andesites to dacites except few low-Mg basalts from Malaya Udina volcano. Phenocrysts are mainly olivine, pyroxene, plagioclase and magnetite, Hb-bearing andesites and dacites are rarely found only in subvolcanic intrusions at Bolshaya Udina volcano. Lavas are geochemically similar to the active Bezymianny volcano, however, individual variations for each volcano exist in both major and trace elements. Trace element geochemistry is typical of island arc volcanism. Compared to KGV lavas all studied rocks form very narrow trends in all major element diagrams, which almost do not overlap with the fields of other KGV volcanoes. The lavas are relatively poor in alkalis, TiO2, P2O5, FeO, Ni, Zr, and enriched in SiO2 compared to other KGV volcanics and show greater geochemical and petrological evidence of magmatic differentiation during shallow crustal processing. Basement samples of the Udinskoe plateau lavas to the east of Bolshaya Udina volcano have similar geochemical composition (trace element enriched high-K basaltic andesites and andesites) and similar eruption age of 274 ka [Calkins et al., 2004] as typical plateau lavas below the northern KGV. This research was supported by RFBR-DFG grant # 16-55-12040. 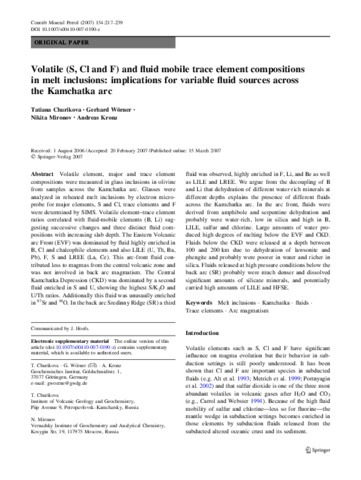 Volatile element, major and trace element compositions were measured in glass inclusions in olivine from samples across the Kamchatka arc. Glasses were analyzed in reheated melt inclusions by electron microprobe for major elements, S and Cl, trace elements and F were determined by SIMS. Volatile element–trace element ratios correlated with ﬂuid-mobile elements (B, Li) suggesting successive changes and three distinct ﬂuid compositions with increasing slab depth. The Eastern Volcanic arc Front (EVF) was dominated by ﬂuid highly enriched in B, Cl and chalcophile elements and also LILE (U, Th, Ba, Pb), F, S and LREE (La, Ce). This arc-front ﬂuid contributed less to magmas from the central volcanic zone and was not involved in back arc magmatism. The Central Kamchatka Depression (CKD) was dominated by a second ﬂuid enriched in S and U, showing the highest S/K2O and U/Th ratios. Additionally this ﬂuid was unusually enriched in 87Sr and 18O. In the back arc Sredinny Ridge (SR) a third ﬂuid was observed, highly enriched in F, Li, and Be as well as LILE and LREE. We argue from the decoupling of B and Li that dehydration of different water-rich minerals at different depths explains the presence of different ﬂuids across the Kamchatka arc. In the arc front, ﬂuids were derived from amphibole and serpentine dehydration and probably were water-rich, low in silica and high in B, LILE, sulfur and chlorine. 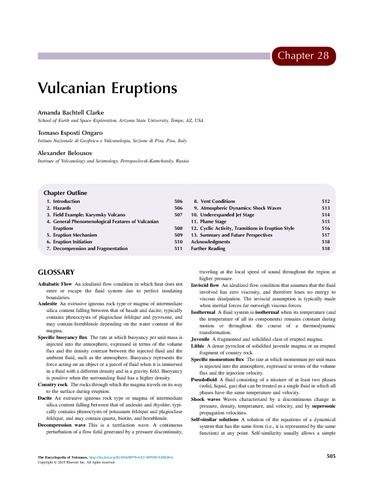 Large amounts of water produced high degrees of melting below the EVF and CKD. Fluids below the CKD were released at a depth between 100 and 200 km due to dehydration of lawsonite and phengite and probably were poorer in water and richer in silica. Fluids released at high pressure conditions below the back arc (SR) probably were much denser and dissolved signiﬁcant amounts of silicate minerals, and potentially carried high amounts of LILE and HFSE.